Few monuments are as memorable within the history of Western Civilization as the Cathedral of Notre Dame in Paris, so when fire almost entirely consumed the church today, people around the world were in shock. Sitting on the Ile-de-la-Cite, the iconic building is famous not only as a beautiful example of early Gothic architecture, but also for its testament to a variety of historical events over the past 800 years. It has been the site of coronations over centuries, it survived the French Revolution, and survived the Nazis during World War II. During the French Revolution it was converted into a “Temple of Reason” for a short time, and after the liberation of Paris in 1944, it was the site of celebration among citizens. Today, alongside the Eiffel Tower, it stands as a symbol of France. 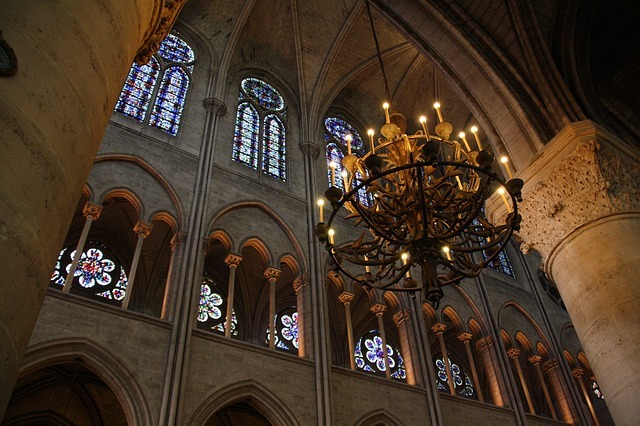 Notre Dame was born into an architectural age of twelfth-century medieval France after the new style, which we call “Gothic”, began to influence church construction about twenty years earlier at the Abbey church of Saint-Denis. 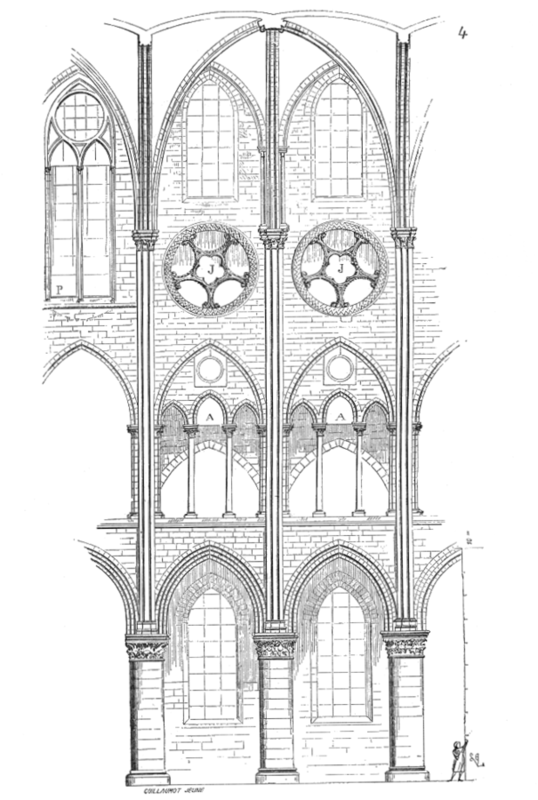 Other French churches, such as those at Chartres and Laon, would also be constructed in this style during the century which revolved around a two key structural improvements – the pointed arch and the ribbed vault – which allowed weight to be channeled more efficiently than was possible during the preceding Romanesque period. This made it possible to not only create taller structures than previously possible, but also to replace the mass of walls with open and airy spaces, as well as stained glass windows. By the end of the twelfth century the Gothic age would take yet another step forward into the “High Gothic” period when flying buttresses were added to the arsenal of building construction. 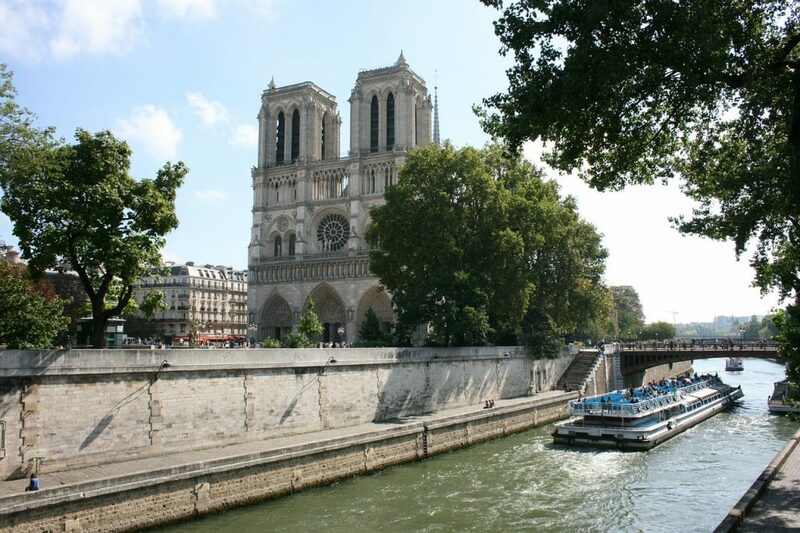 Construction on Notre Dame cathedral began in 1163. The transept and choir sections were finished by 1182, and the nave by 1225. The facade was later completed by around 1260. At 400 feet long, it is a huge cathedral – the largest of all from the early Gothic period – and quite tall at 108 feet in height. The modified elevation (on the left) beside the original elevation (and Viollet-le-Duc restoration). On the exterior, the church is famed for its quaint appearance hugging the Ile-de-la-Cite along the Seine. Part of its grand look is due to its spider-like flying buttresses which project from the apse exterior. 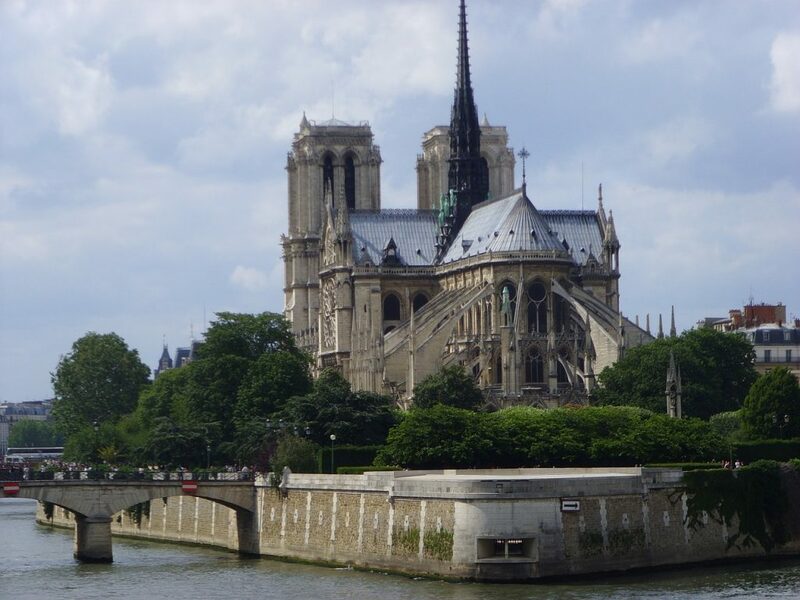 Since the flying buttresses used on the cathedral were installed after the church was built, rather than as part of its original design, it is likely that Notre Dame did not benefit from them in quite the same way that other churches were which incorporated them from the beginning. Today, Notre Dame continues to survive, albeit bruised and broken from the fire. As one of the few medieval structures that have become a household name throughout the world, the church occupies a special status in the hearts and minds not only of the French, but for anyone who loves the heritage of Western Civilization. Will the church be rebuilt? Macron has already pledged to do just that, and it can potentially be done with the help of laser scans of the building that have recently be done, but there will inevitably be some loss after destruction of this magnitude. If there is a silver lining to this, it’s that for a rare moment, people in the West stopped for a moment to realize that the heritage of Western Civilization still means something. In fact, it means a lot. It’s just a shame that it took a situation of this gravity to make people remember that. News came out recently that a Der Spiegel writer, Claas Relotius, fabricated a number of stories for the German magazine over the years. He helped craft around 60 articles over the last seven years and enjoyed so much success there that in 2014 he was awarded with the title of CNN Journalist of the Year. While this might seem like distant news to us in the United States, Relotius’ work often touched on American news, which means he may have had a significant influence on the creation of German and pan-European thought (the publication has a circulation of 840,000 per week). One of the stories that caught my attention was one that Relotius did on the politics of the small Minnesota town of Fergus Falls. Relotius spent time living in the rural town in early 2017, not long after Donald Trump won the election. One of the more unsettling false claims made in the story was that a sign greeted visitors to the town which read “Mexicans Keep Out”, but this was hardly the only fabrication that would appear in the story. The young, lonely city administrator walked around with a Beretta at work and enjoyed eighteenth-century French philosophy. The townspeople liked the movie American Sniper so much that it continued to be played at the local movie theater two years after its original run in 2015. A woman named Maria Rodriguez owned the local Don Pablo’s Restaurant, had kidney disease, and became a Trump supporter due to expenses under Obamacare. Also, that she had a (non-existent) high school son named Israel. A rather involved, western-themed party that no one can seem to remember. What’s staggering about this is the sheer distortion of the facts provided by Relotius. This wasn’t a case of simply mistaken identities or exaggerating here and there, but outright falsehoods. What is the effect that such fake news might have on influencing public opinion? If you connect the dots in the story about Fergus Falls, they all seem to paint the town as a kind of eccentric Trump-loving wasteland, the kind that seems to play on a variety of stereotypes that foreigners might take at face value. We really should question how much this kind of article – or any other articles by this author – influenced the winds of public discourse in Germany and throughout Europe as a result. Did it make any European leaders less inclined to work with Trump, thinking that his followers were intolerant, crazy racists? Did it change the way Europeans wanted to deal with the U.S. in light of the sample of “fly-over country” citizens portrayed in the story? I think it would be a stretch to think that the faked articles created by Relotius did not have a negative effect on the U.S. or Trump as a result. I should point out that this happened at Der Spiegel, the so-called “world’s largest fact checking operation”. Back in 2010, the publication had around 80 full-time people checking facts and doing related work. One scratches one’s head wondering what kind of effectiveness they have if a single journalist can pass off over a dozen stories with faked content. Not long ago, President Trump was maligned for calling the media the “enemy of the people”. While that may be hyperbole, it is definitely possible to see the far-reaching, harmful socio-political effects by even a single journalist who decides to go off the rails to pursue some untruthful objective. Once false news has been published, it is difficult, if not impossible, to restore views to the status quo. People who read Relotius’ article in early 2017 have already had their opinions affected, and have probably voted in elections and argued for this or that policy. So how many other journalists are out there doing this very thing? We only hear about those who are caught before they fade into our collective memories, but their damage has already been done. If not enemies of the people, then they are exploiters of people’s trust and distorters of reality. Within the microblogging sphere of the social media world, Twitter reigns supreme. But can it stay on top in a fidgety age when other shiny new digital toys are in reach? Enter the microblogging Twitter alternative, Gab. Created in August 2016 (over a decade after Twitter’s birth), Gab offers a strong set of competitive features which make it a formidable rival to its older foe. While I have been using Twitter for years, I recently had the opportunity to dive into Gab’s universe. Having surpassed the 1000 post mark on the service, I have a good sense of what works on Gab, and what doesn’t. Here is my analysis of competition between Gab and Twitter. Both Twitter and Gab have similar interfaces consisting of a horizontal, top banner with multiple columns of text and news underneath. Twitter’s familiar three-column interface contains a space for trending topics, Tweets sent by users, and other information (e.g. “Who to follow”). Because Gab’s two-column interface has one column dedicated to trending topics (and a few other quick links) and and another column for messages (or “Gabs”) sent by people you follow, it allows for a roomier appearance. I also noticed that the font that Gab uses is noticeably larger font than Twitter, which uses Neue Helvetica (possibly 11 pt). The font seen on Gab appears to be Arial 13 pt, which makes the service look clumsier on one hand, but easier to read on the other. Although both services look relatively similar, the appearance of Twitter is cleaner and more polished. Still, I think that it would not be very difficult for Gab to close this gap. With a few simple changes, Gab could improve its aesthetics to rival that of Twitter. Twitter and Gab follow the same format of allowing users to post short messages with the option of attaching images, gifs, or polls. Twitter also allows for tagging one’s location, but aside that the services are similar. There are, however, a few differences worth discussing more. Twitter allows a maximum of 280 characters per message, and Gab allows a maximum of 300 characters (recall that it was earth-shattering news in the Fall of 2017 when Twitter increased its character count from its paltry 140-character limit). The extra 20 character Gab offers isn’t a huge advantage, but it is at times helpful. I have run up against the 300-character limit several times. A more important difference is that Gab allows for both deletion and editing of posts after they have been published. Twitter allows only deletion, but not editing. It seems that there have been serious grumblings about the inability to edit Tweets in the past, and I know that politicians and/or celebrities have sometimes been burned by writing ill-advised Tweets, only to delete them later (the equivalent of doing the “Walk of Shame”). Editing posts on Gab is a big plus because it allows you to modify a message if you regret something you posted in haste, or even to correct a stupid typo that you made while writing quickly. Gabs that have been edited are marked as such, and if it was directed at a person the recipient gets a notification that the post has been edited. In my opinion, this is a huge advantage for Gab. Another feature difference centers on Gab users’ ability to upgrade their accounts to Gab Pro status for a fee. The Gab Pro user has special privileges, such as writing much longer posts, special formatting (bold, underline), and creating lists. This paid user structure allows Gab to operate without posting ads elsewhere on the site. Twitter does not have anything quite like this and gets money by posting rather obtrusive ads, but it does give all users the ability to create lists, which I have found this to be very handy at times. Although it might seem like Gab Pro users would have an unfair advantage over regular, non-paying Gab users (like me), I haven’t found that conversations with Pro users suffer because the other person can create longer posts than me. The Gab approach seems to work, and it’s nice to avoid those annoying ads like on Twitter. The way Twitter is designed, users primarily interact with Tweets by people whom they follow, and secondarily by clicking on trending topics or hashtags to see what the universe of Twitter users are saying. In my understanding, trends on Twitter are generated when large numbers of people tweet particular phrases or hashtagged words. With Gab, it’s generally the same, but instead of keywords generating the trends, it’s topics. Gab users have the ability to create Gabs independent of a topic, or may create a new topic so that anyone may post a Gab that belongs to that topic. I find Gab’s approach to topics to be really useful and it really helps to focus conversations by subject matter. Topics are chronologically-arranged, so the most recently-created topics are pushed to the top. While the Gab system opens the door for abuse (people can start topics on whatever distasteful topic they want), it also leads to an almost forum discussion-like feeling within a microblogging format. The last difference to discuss is the type of content you’ll find on Twitter and Gab. Twitter is such a huge universe compared to Gab that it’s hard to compare, but with Twitter there are a lot more topics discussed. 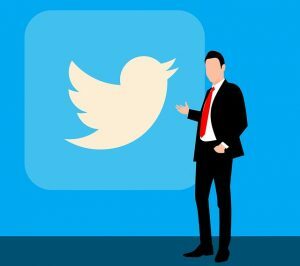 The simple fact that every major business around today has a Twitter account means that the service can be used for commercial needs, as well as customer service issues. Twitter is also used by users from the entire spectrum of life, from sports to business, from education to religion, from art to history, and everything in between. The fact that there’s something for everything on Twitter is a big plus. Oh, and in case you haven’t heard, it’s also used for politics. Political content from different perspectives is present there, but in my opinion, there is a more left-leaning sense there, either because of the prevalence of more left-leaning Twitter users, or because of the manipulation by left-leaning Twitter engineers (Twitter has been accused of bias in the past, and Jack Dorsey essentially agreed that people who worked there tended to be liberal). I’ll add here that this has been complicated by the fact that Twitter seems to have engaged in banning or shadowbanning users with more frequency lately for conservative-leaning speech. It also ramped up its crackdown on so-called “hate speech”. The problem is that there’s not a consensus of what “hate speech” actually is, and there’s also a question of whether or not it should be protected or banned by services such as Twitter. Meanwhile, Gab markets itself as a “free speech” zone where almost anything goes. What Twitter punishes, Gab protects. This is both an extreme positive for Gab, but a thorn in its side as well. A sizeable crowd of racist and Antisemitic users has found a home on Gab, which means that you’re almost bound to be exposed to some pretty nasty stuff when you sign up. There is a way to “mute” users, but you essentially have to be exposed to their posts before you can mute them. You can also only mute one-at-a-time, which makes this a difficult task. Gab also offers the ability to mute content by keyword, but in my experience this doesn’t work all the time. Apart from that, Gab offers plenty of political talk which leans decidedly to the right. You can also click through categories of other types of content, such as “Cuisine” or “Art” or “Finance”, but in my opinion, political talk still reigns supreme. This is almost assuredly due to the size of the service; as of August 2017, Gab had 225,000 users, compared to Twitter’s 330 million users. Multiply Gab’s userbase by a factor of 10 or more and there is bound to be an expansion of user topics. Although Gab looks like a promising social media service, it is still far too young to truly compete with Twitter. 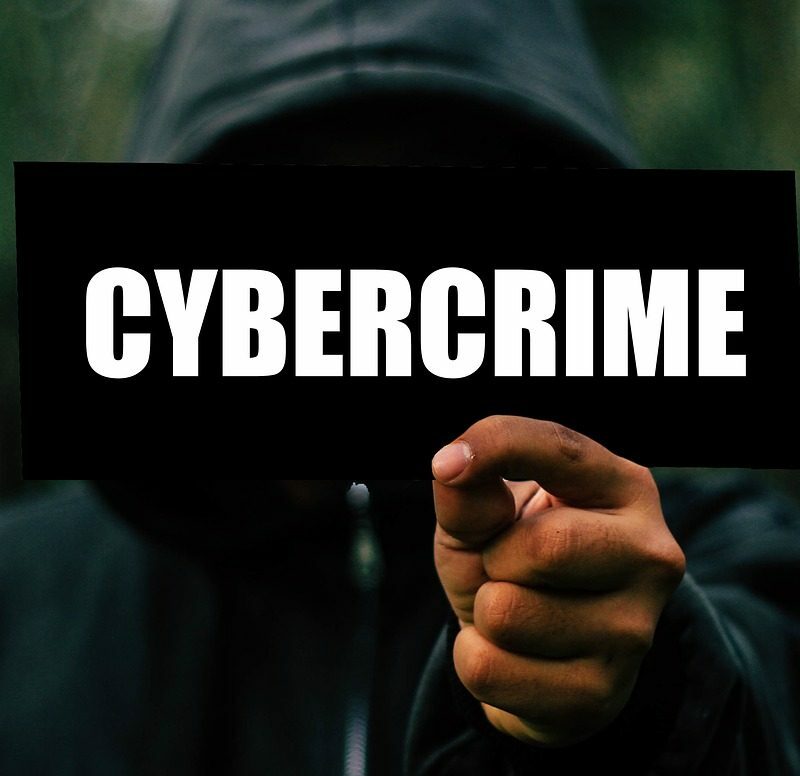 If the lifeblood of microblogging services is their users, then Twitter reigns supreme due to its massive number of users and its acceptance by institutions across the United States and beyond. Further, because Twitter has been adopted by so many people, it’s also extendable to other digital platforms. For example, discussion areas on many websites allow you to participate by logging in with your Twitter username and passwords. Also, as is the case with WesternCivForum.com, it’s incredibly easy to automatically post a Tweet when you publish a web page to another site. This kind of integration isn’t available to Gab, and it’s unclear if it ever will be. True, Twitter’s politics are scary and hostile to free speech, but so far it hasn’t gotten to the point which makes the entire service unusable. Perhaps it will one day, in which case Gab might be a better home. 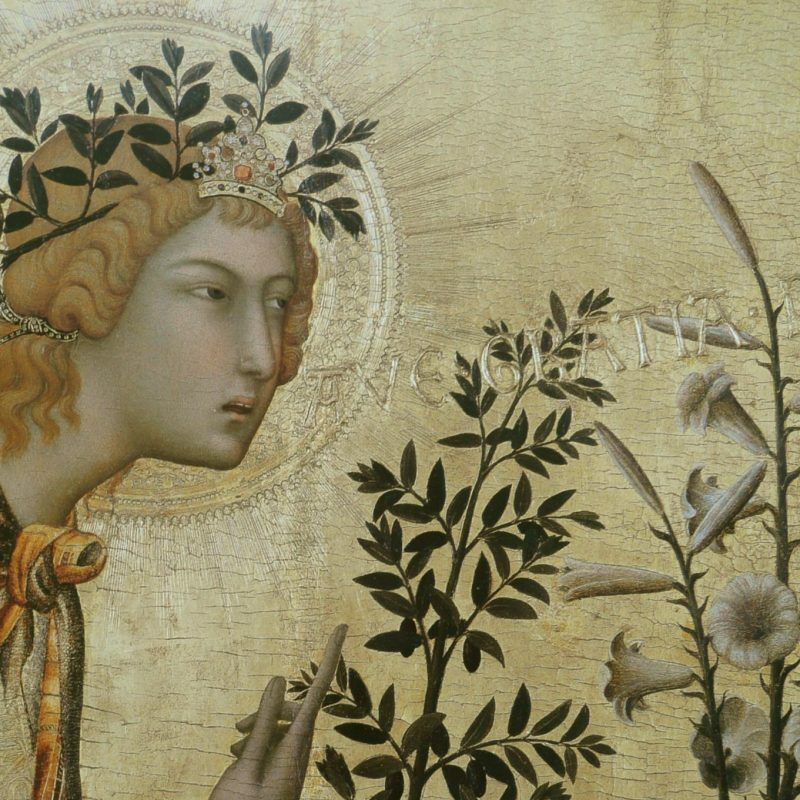 Could modern art benefit from Renaissance-styled patronage? More... about Could modern art benefit from Renaissance-styled patronage? I got spam email from….Steve Mnuchin? More... about I got spam email from….Steve Mnuchin?